A CCTV image has been released of a missing 45-year-old woman whom police believe has been murdered. 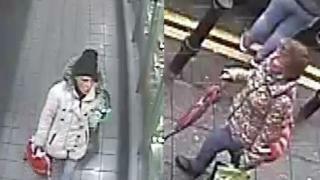 Lancashire Police believe Susan Waring may have been at Asda on School Street, Darwen, at about 13:40 GMT on 29 January. She was last seen at a doctor's surgery on James Street West on 16 January. A man aged 46 who was arrested on Wednesday on suspicion of murder has been released pending further inquiries. Det Ch Insp Geoff Hurst said: "We are treating this CCTV footage as a potential sighting of Susan, and need anyone with information about the two people in the pictures to come forward." He added: "The woman who we believe to be Susan (pictured left in the black hat and grey/silver jacket), was seen to be speaking to another woman (pictured right carrying the umbrella)."